The relationship between health and social context includes a range of factors influencing overall well-being. Social status, class, lifestyle, education, and environment primarily shape these factors. Age, gender, race, and ethnicity are structural variables of equal importance to health outcomes. Health is being facilitated or inhibited by the socioeconomic, cultural, and political backgrounds, in which one is born and raised. 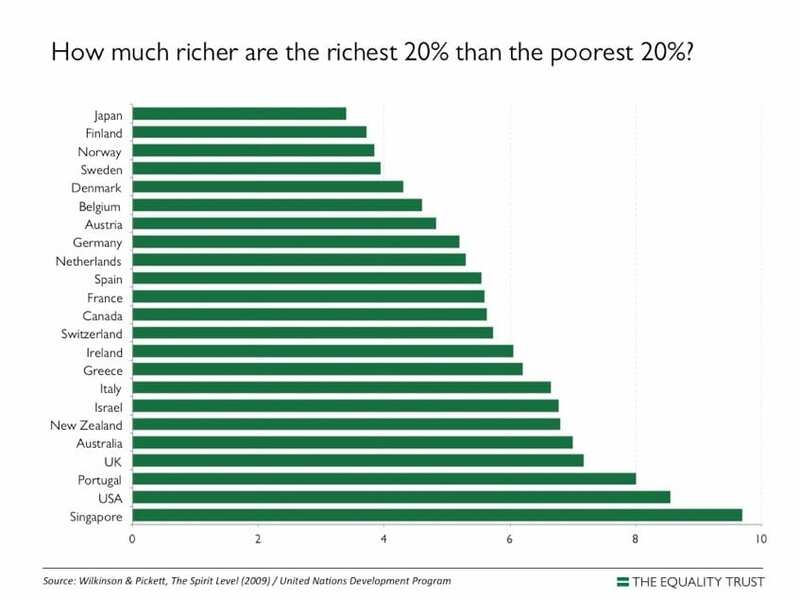 In the last few decades, we have seen growing income inequality between the poor and rich. Since the 1980’s, the United States of America has seen a shift in wealth from the middle class towards the wealthiest people and transnational companies. The top one-tenth of 1 percent owns as much as the bottom 90 percent. Firebaugh and Beck argued economic growth would automatically benefit the masses, which in hindsight seems questionable. As health outcomes and life expectation closely liaise to within-country income inequality, policy should aim at finding appropriate actions to address this phenomenon. The global financial crisis and the political reflex in countering this event with austerity measures has led to a widening income gap, of which the results are prone to curtail overall health. 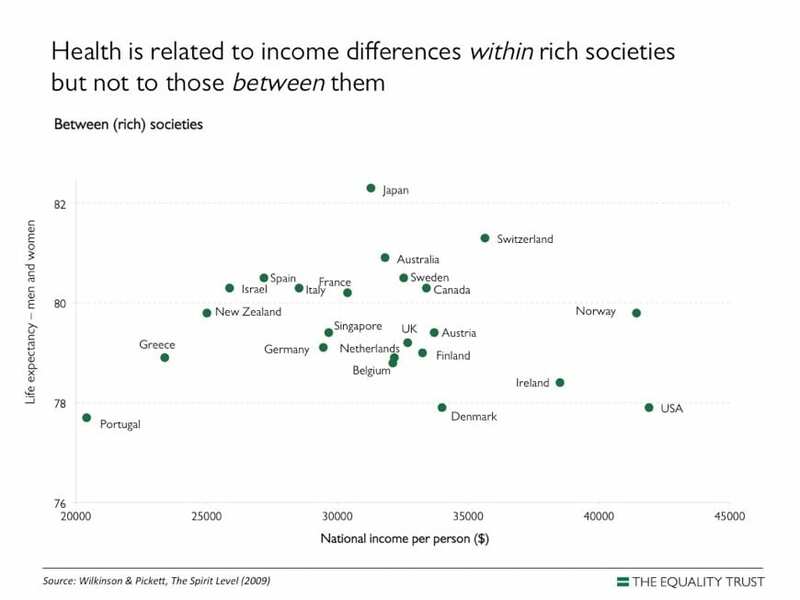 Wilkinson and Pickett found health issues to be strongly correlated to income inequality within a country. To support this finding, they used two different measurement tools. The first index, applied to Western countries, was a ratio of the 20 percent top incomes in relation to the 20 percent of the bottom earners. For different states within the USA they used a second index, the Gini-index, which adopts a different methodology. Where ‘Gini = 0’ represents perfect equality (same income for everyone) and ‘Gini = 1’ is total inequality (if all income goes to one person). The outcome of these results showed that the widening income gap led to an increase of different health issues related to mental disorders, life expectancy, infant mortality, obesity and teenage births. 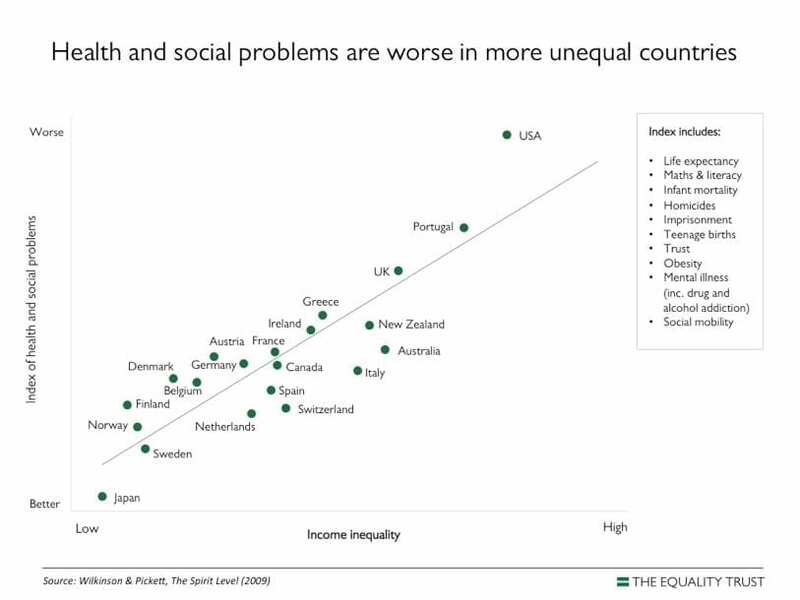 Societal problems that correlated to income inequality included: lower levels of trust, less educational performance, more homicides, higher imprisonment rates and a lack of social mobility. Some authors found Wilkinson and Pickett’s dismissal of poverty in relation to health outcomes incorrect as they did not measure it. On the other hand, research by Beckfield and Bambra confirmed the correlation between life expectancy and health stating that the lagging welfare state in the USA led to an average loss of 3.77 quality life years in comparison to other OECD countries. The USA has an income gap of 8:1 (the average biggest earners have 8 times the wage of those at the other end of the spectrum) leading to a life expectancy of 78.7 years, which is in contrast with Japan reaching an average of 83.0 years with an income gap of 4:1. The same age dependent relation has been found in Scandinavian countries having similar income gaps as Japan. Goda and Torres Garcia looked at the rise of global inequality and confirmed previous results by stating that within-country inequality is responsible for 70 percent of the global inequality, suggesting 30% is due to in-between country inequality. Taking national and local figures into account for the UK, the Office for National Statistics observed a life expectancy for new-born baby boys to be 83.3 years in the Kensington and Chelsea area. Meanwhile, the life expectancy for the same cohort in Blackpool is merely 74.7 years. Nationwide, the female life expectancy is 86.6 years in Purbeck and the lowest in Glasgow City with an expectancy of 78.5 years. The authors conclude that inequality has increased over the last two decades despite improvements in these local areas. 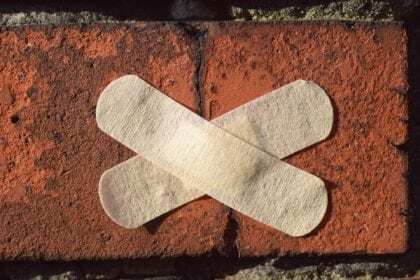 We may assume a strong relation between income inequality and health outcomes on a global scale as Dorling in recent research concludes there are overarching arguments. Dorling (2007) confirmed a strong relation between income inequality and negative health outcomes on a global scale after an observational study performed in 126 countries. The academic world has provided alternatives to deal with the widening gap between poor and rich. Reformed minimum wages, living wages, basic income or a global ‘fair tax’ and redistribution are only a few austerity counter-proposals to ensure overall well-being by reaching or transcending the poverty line. Minimum wages have proven insufficient and a basic income is still globally debated. An international fair tax may even prove more challenging as this requires global political support. Minimum wages and living wages have the same aim; raising income for the least fortunate to reduce the impact of a growing income gap. A minimum wage is defined as a minimum market valued income, imposed by law and paid by employers. A living wage is a locally liaised and negotiated pay rate that a fulltime employee needs for a household of four to reach the poverty line. For the latter, societal context is important, as living in a metropolitan area is more expensive than living in the countryside. The Basic Income Earth Network defines basic income as “a periodic cash payment unconditionally delivered to all on an individual basis, without means, test or work requirement”. A locally implemented living wage project in the UK, facilitated by the General and Municipal Boilermakers Union in 400 councils, has proven to be successful in reducing (health) inequalities as well as being beneficial for government tax income. Awareness within the community influenced policy in a way that living wages became accepted as a benchmark for society. In this regard, a living wage clearly will contribute to individual well-being and social cohesion – both factors improve health within communities. Proposals for a Universal Basic Income (UBI) are slowly reaching the minds of global policymakers, but this process will take more time in achieving broader support. In developing a short-term response tackling inequality, a living wage appears to be a possible solution for developed countries yet remains a huge challenge for developing countries. Emerging new technologies will demand economical strategies that are able to cope with less job certainty and keeping up with growing demands in healthcare. A redistribution of capital, as proposed by Thomas Piketty in his book ‘Capital in the Twenty-First Century’, in combination with a UBI may prove to be the best strategy in the long-run to counter income-related health inequalities on a global scale. We must urge politicians to finally face transnational companies and the top one percent in order to obtain a globally acceptable taxation rate. Sam Brokken hails from Belgium and lives near the city of Leuven. He studied physiotherapy, sports physical therapy and manual therapy practicing these areas for years in private practices within local communities. He lectures in musculoskeletal disorders in relation to manual handling and ergonomics for healthcare service providers. He is currently engaged in postgraduate work at the Robert Gordon University (Aberdeen – Scotland) within the MSc Public Health and Health Promotion course. ATKINSON, A.B., 2014. After Piketty?, British Journal of Sociology, vol. 65, no. 4, pp. 619-638. BATTISTONI, A. 2017., The False Promise of Universal Basic Income, Dissent, vol. 64, no. 2, pp. 52-62. BECKFIELD, J. and BAMBRA, C., 2016. Shorter lives in stingier states: Social policy shortcomings help explain the US mortality disadvantage, Social science & medicine, vol. 171, pp. 30-38. BORRELL, C. et al., 2013. Influence of Macrosocial Policies on Women’s Health and Gender Inequalities in Health, Epidemiologic Reviews, vol. 36, pp. 31-48. COCKERHAM, W.C., 2014. Social causes of health and disease, 2nd ed edn, Wiley, Hoboken, pp. 214, 230-238, 252, 266-281. CONNELL, R., 2012. Gender, health and theory: Conceptualizing the issue, in local and world perspective, Social Science and Medicine, vol. 74, no. 11, pp. 1675-1683. DE WISPELAERE, J., 2016. Basic Income in Our Time: Improving Political Prospects Through Policy Learning?, Journal of social policy, vol. 45, no. 4, pp. 617-634. DORLING, D. 2013. Unequal health: the scandal of our times, The Policy Press, Bristol, pp. 298-308. FIREBAUGH, G. and BECK, F.D., 1994. Does Economic Growth Benefit the Masses? Growth, Dependence, and Welfare in the Third World, American Sociological Review, vol. 59, no. 5, pp. 631-653. GODA, T. and TORRES GARCIA, A., 2017. The Rising Tide of Absolute Global Income Inequality During 1850-2010: Is It Driven by Inequality Within or Between Countries?”, Social Indicators Research, vol. 130, no. 3, pp. 1051-1072. GOVERNMENT EQUALITIES OFFICE UK, 2016. UK Gender Pay Gap. [Online]. Available from: https://www.gov.uk/government/news/uk-gender-pay-gap [Accessed 25 April 2017]. GREATER LONDON AREA COUNCIL, 2014. A Fairer London: The 2013 Living Wage in London. [Online]. Available from: https://www.london.gov.uk/what-we-do/business-and-economy/business-and-economy-publications/fairer-london-2013-living-wage [Accessed 29 April 2017]. HOLGATE, J. and WILLS, J., 2007. Organizing Labor in London, in Labour in the New Urban Battlegrounds, eds. L. Turner & D. Cornfield, Ithaca: ILR Press, pp. 211-223. HOULE, J.N. and MARTIN, M.A., 2011. Does intergenerational mobility shape psychological distress? Sorokin revisited, Research in Social Stratification and Mobility, vol. 29, no. 2, pp. 193-203. ILSOE, A., 2016. From living wage to living hours – the Nordic version of the working poor, Labour & Industry (Taylor & Francis Ltd), vol. 26, no. 1, pp. 40-57. KENWAY, P. and PALMER, G., 2007. Poverty among ethnic groups how and why does it differ?, Joseph Rountree Foundation/New Policy Institute. MACIONIS, J.J. & PLUMMER, K., 2012. Sociology: a global introduction, in 5th ed edn, Prentice Hall, Harlow, pp. 319-335. MACK, J., 2016. Income threshold approach, [Online]. Available from: http://www.poverty.ac.uk/definitions-poverty/income-threshold-approach [Accessed 3 May 2017]. MAJID, M.F. et al., 2016. Do minimum wages improve early life health? Evidence from developing countries, Social science & medicine (1982), vol. 158, pp. 105-113. MARMOT, M., 2010. 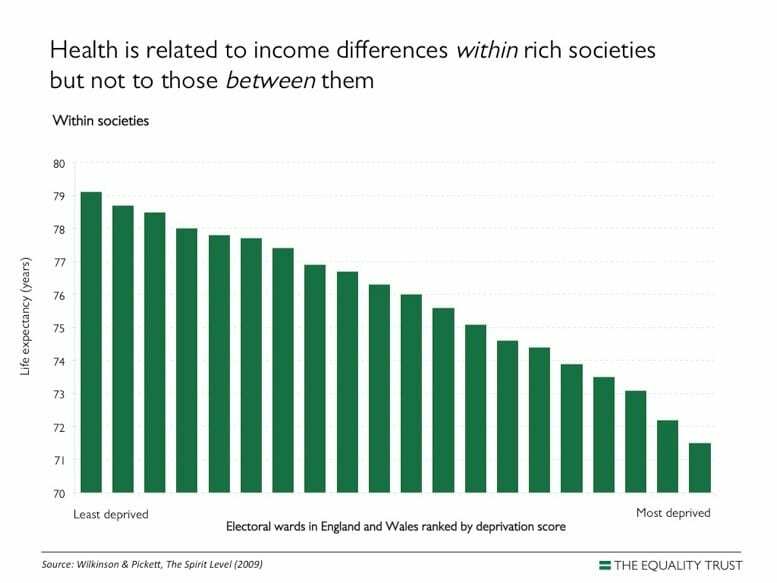 Fair society, Healthy lives, The Marmot Review: Strategic Review of Health Inequalities in England post-2010, [Online]. Available from: http://www.instituteofhealthequity.org/projects/fair-society-healthy-lives-the-marmot-review [Accessed 22 April 2017]. MCBRIDE, S. and MUIRHEAD, J., 2016. Challenging the Low Wage Economy: Living and Other Wages, Alternate Routes, vol. 27, pp. 55-86. MERLUZZI, J. and DOBREV, S.D., 2015. Unequal on top: Gender profiling and the income gap among high earner male and female professionals, Social science research, vol. 53, pp. 45-58. MERRILL, M., 2014. How Capitalism Got Its Name, Dissent, vol. 61, no. 4, pp. 87-92. OLUGBENGA, O., 2014. Life Expectancy at Birth and at Age 65 by Local Areas in the United Kingdom: 2006-08 to 2010-12. [Online]. Available from: https://www.ons.gov.uk/peoplepopulationandcommunity/birthsdeathsandmarriages/lifeexpectancies [Accessed 24 April 2017]. PALENCIA, L. et al., 2014. The influence of gender equality policies on gender inequalities in health in Europe, Social science & medicine, vol. 117, pp. 25-33. PARNCUTT, R., 2012. Universal basic income and flat income tax: Tax justice, incentive, economic democracy, 14th BIEN Conference, 2014. Montreal, Canada. PICKETT, K.E., 2014. Addressing Health Inequalities Through Greater Social Equality at a Local Level: Implement a Living Wage Policy. [Online]. Available from: http://www.britac.ac.uk/publications/if-you-could-do-one-thing [Accessed 22 April 2017]. PICKETT, K.E. and WILKINSON, R.G., 2015. Income inequality and health: A causal review, Social science & medicine, vol. 128, pp. 316-326. PIKETTY, T., 2014. Capital in the twenty-first century: a multidimensional approach to the history of capital and social classes, The British journal of sociology, vol. 65, no. 4, pp. 736-747. PROWSE, P. and FELLS, R., 2014. The Living Wage: Policy and Practice, Association of Industrial Relations Academics of Australian and New Zealand, Melbourne. PROWSE, P. and FELLS, R., 2016. The living wage in the UK – an analysis of the GMB campaign in local government, Labour & Industry (Taylor & Francis Ltd), vol. 26, no. 1, pp. 58-73. RAMBOTTI, S., 2015. Recalibrating the spirit level: An analysis of the interaction of income inequality and poverty and its effect on health, Social science & medicine, vol. 139, pp. 123-131. RIEKER, P.P. and READ, J.G., 2016. Constrained Choice Theory: Understanding Gender Health Inequalities in Global Perspective, Conference Papers — American Sociological Association, pp. 1-35. ROBERTS, M., 2015. Thomas Piketty and the Search for r, Historical Materialism, vol. 23, no. 1, pp. 86-105. SANDERS, B., 2016. Income and Wealth Inequality. [Online]. Available from: https://berniesanders.com/issues/income-and-wealth-inequality/ [Accessed 23 April 2017]. SAVAGE, M., 2015. Introduction to elites from the ‘problematic of the proletariat’ to a class analysis of ‘wealth elites’, Sociological Review Monograph, vol. 63, no. 2, pp. 223-239. SHIM, J. and SIEGEL, J., 1995. Dictionary of Economics, 1995th edn, John Wiley and Sons Ltd, New York, United States. SMITH, L., 2015. Reforming the minimum wage: Toward a psychological perspective, American Psychologist, vol. 70, no. 6, pp. 557-565. SMITS, J. and MONDEN, C., 2009. Length of life inequality around the globe, Social science & medicine, vol. 68, no. 6, pp. 1114-1123. SPIJKER, J.J.A. and ESTEVE, A., 2011. Changing household patterns of young couples in low- and middle-income countries, History of the Family, vol. 16, no. 4, pp. 437-455. SULLIVAN, L., et al., 2015. The Racial Wealth Gap. [Online]. Available from: http://www.demos.org/sites/default/files/publications/RacialWealthGap_1.pdf [Accessed 25 April 2017]. THE LIVING WAGE FOUNDATION, 2014. The Calculation. [Online]. Available from: http://www.livingwage.org.uk/calculation [Accessed 28 April 2017]. TORRY, M., 2014. A Basic Income is feasible: ‘But what do we mean by “feasible’”, BIEN Congress, 2014, Montreal, Canada. TOUROUGUI, T., 2017. Poverty Counts: The Future of Global Poverty Monitoring at the World Bank. [Online]. Available from: http://www.worldbank.org/en/events/2017/04/03/Future-of-Global-Poverty-Monitoring [Accessed 23 April 2017]. VAN PARIJS, P., 2004. Basic Income: A Simple and Powerful Idea for the Twenty-First Century, Sage Publications Inc.
VAN PARIJS, P. and VANDERBORGHT, Y., 2017. Basic Income: A Radical Proposal for a Free Society and a Sane Economy, 2017th edn, Harvard University Press, Cambridge, Massachusetts. WELLS, C., 2016. Persistent Poverty in the UK and EU: 2014. [Online]. Available from: https://www.ons.gov.uk/peoplepopulationandcommunity/personalandhouseholdfinances/incomeandwealth/articles/persistentpovertyintheukandeu/2014 [Accessed 12 May 2017]. WHO, 2008. Key concepts. [Online]. Available from: http://www.who.int/social_determinants/thecommission/finalreport/key_concepts/en/ [Accessed 25 April 2017]. WHO, 2016. Life expectancy at birth (years) 2000-2015. [Online]. Available from: http://gamapserver.who.int/gho/interactive_charts/mbd/life_expectancy/atlas.html [Accessed 28 April 2017]. WICKRAMA, K. et al., 2016. The Health Impact of Upward Mobility: Does Socioeconomic Attainment Make Youth More Vulnerable to Stressful Circumstances?, Journal of Youth & Adolescence, vol. 45, no. 2, pp. 271-285. WILKINSON, R.G. and PICKETT, K. 2010, The spirit level: why equality is better for everyone, New [ed.] edn, Penguin, London, pp. 21-33, 157-185, 205 -237. WILLS, J. and LINNEKER, B., 2012. The cost and benefits of the London living wage, Trust for London/Queen Mary University of London, London. WOHLAND, P. et al., 2015. Inequalities in healthy life expectancy between ethnic groups in England and Wales in 2001, Ethnicity & health, vol. 20, no. 4, pp. 341-353. YUILL, C., et al., 2010. Key concepts in health studies, Sage, Los Angeles, Calif., London. Exactly. Reminds me of (the title of) the book Eats, Shoots and Leaves.